This gardening season got off to a rough start for me. I think I may have started planting outside a little too early this year. The unseasonably warm weather we had in April lulled me into a false sense of security and I went ahead and planted 2 weeks earlier than usual. And unfortunately, we had a frost two weeks later. 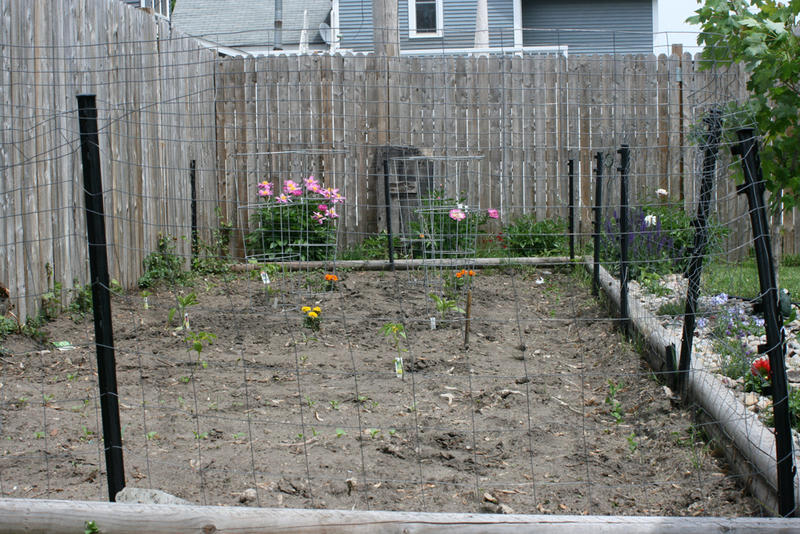 Most of the garden made it through, but about half of the bean and pea seedlings didn’t make it. 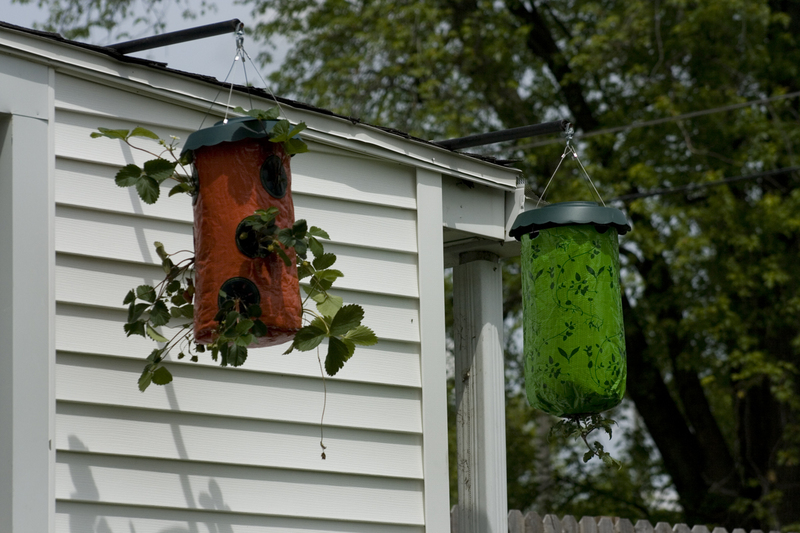 I replanted, only to have the birds (I suspect, or maybe the grubs) eat half of them. I replanted some more seeds to fill in the gaps yesterday. Hopefully those will survive. Third time’s a charm, right? I also had a run-in with poison ivy while clearing weeds around my peonies. This is the first time I have ever reacted to poison ivy. It was one of those “Oh sh…..” moments, when I realized that the armload of weeds I had pulled and was carrying to the weed pile was infested with poison ivy. It had been hiding under the other vines, so I didn’t notice it until it was too late. Luckily, the reaction was mild and I now definitely know what poison ivy looks like. And since things seem to happen in threes, a swarm of ants attacked my arm while planting the pepper plants. They were small but packed a big sting. Hopefully that is all the bad gardening luck I will experience this year. The garden is in. 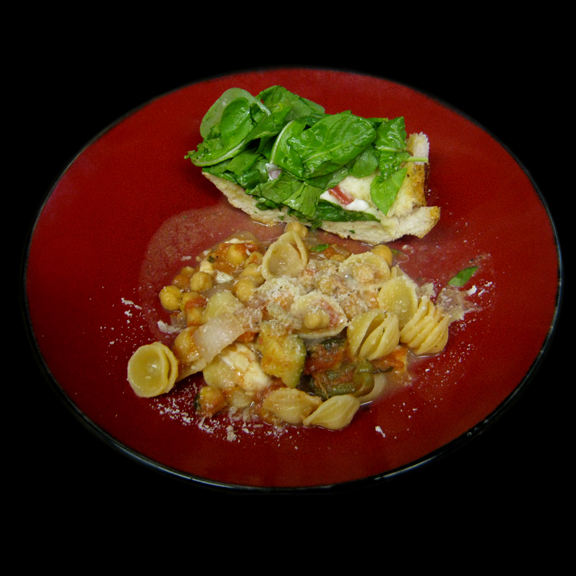 I planted spinach, arugula, sugar-snap peas, beans, banana peppers, jalapenos, some kind of yellow hot pepper that I don’t remember the name of, Lemon Boy tomatoes, Roma and cherry tomatoes, sweet red peppers, watermelon and strawberries. I also planted some basil, oregano, thyme, rosemary, parsley and lots of wildflowers for the bees and butterflies around the edge of the garden. I decided to try the strawberries and one tomato plant in one of those upside down planters. I’m not too convinced they will work, but I was curious to try them. We did eat 3 strawberries from the planter already and they were sweet and yummy. I hope there are many more to come. 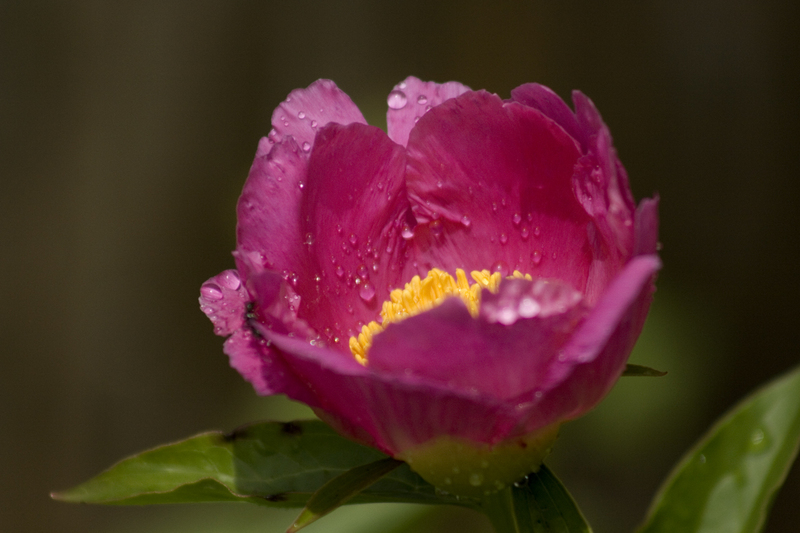 I was also excited to see the peonies recovered nicely after the run-in they had with the mower last year. They came back much larger than I expected this year. It was a nice surprise, and all but 2 are blooming beautifully. 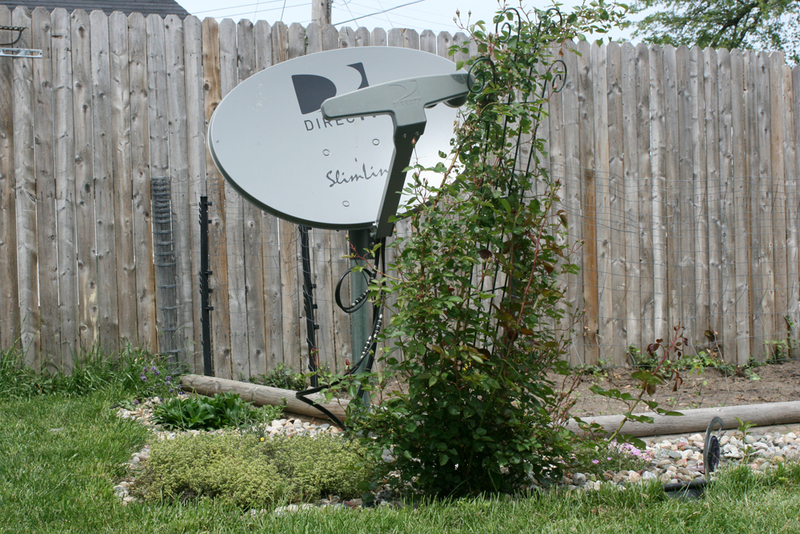 Another nice surprise was the rose bush that we discovered by the satellite dish last summer. It almost got covered over with rocks, it had been mowed over several times last spring, and almost got dug up when the satellite dish was installed last winter. The previous owners of the house didn’t even know it was there. When we went to put in the rock garden, I noticed it and did my best to save it. I’ve never grown roses, so I had no idea what to expect. I never really expected it to get this big. And it is full of buds. I can’t wait until they all bloom. And nature never ceases to amaze me with its resiliency. Do you garden? What did you plant this year? 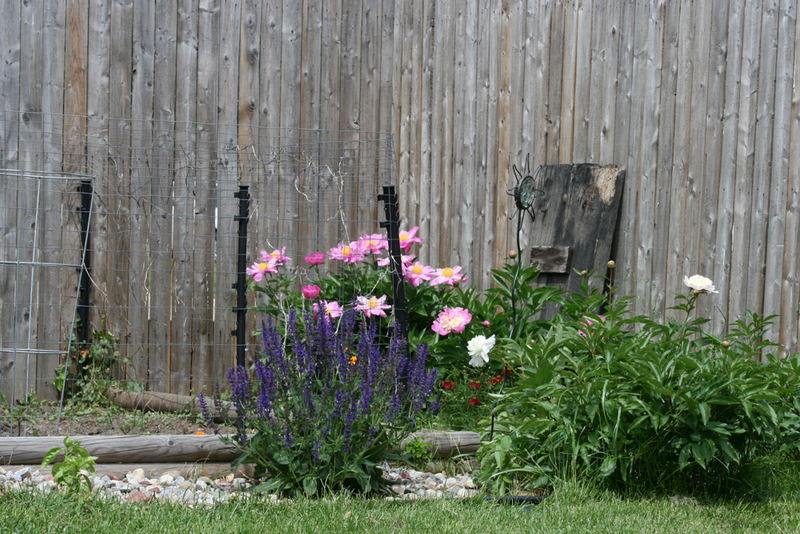 Any gardening tips you would like to share? 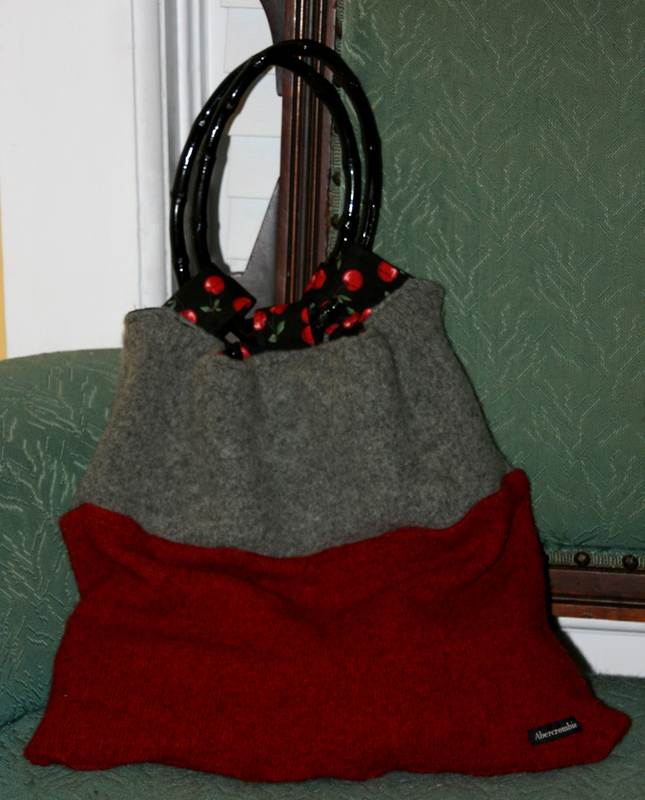 I did finish my sweater purse. Actually, I finished it a couple of weeks ago and am finally getting around to posting it. It is not my best sewing example, but I still like how it turned out. I used two sweaters – one red and one gray. And the lining was some cherry fabric by Michael Miller that I had leftover from an apron I made last year. Both of the sweaters I used were wool, so I felted them in the washer and dryer. Felting the sweaters helps add some texture and strength to the wool. It is easy to do – just wash them in hot water and dry in the dryer. Repeat this process until you can no longer detect the weave in your sweater. I’ve been using my purse daily since I finished it and it is holding up nicely. I’ve also gotten a lot of complements on it, even if it’s not my best sewing example. I do like the purse though. It is big and roomy, so I can carry all the stuff I need to take with me when I go out – even a textbook fits inside for the days when I need to study in my spare time. The only thing I am not happy with are the handles. I didn’t have anything else on-hand at the time, so I used what I had. I might change them out in the near future for circle handles. I think circles might be easier to carry. The shape that is on there now keeps getting tangled and they just don’t function properly. I kind of just made this purse up as I went along. And I didn’t write a tutorial because there are hundreds of them on the Web already. I did however, compile a list of some of the best ones I found for you to browse for inspiration. And you can download a free pattern at YouCanMakeThis.com. And while you are over there, be sure to check my ePatterns – on how to make clothing from recycled ties and denim. Have fun and happy upcycling!